There is always a lot of excitement around the time of year when Pantone announces their hottest new color. 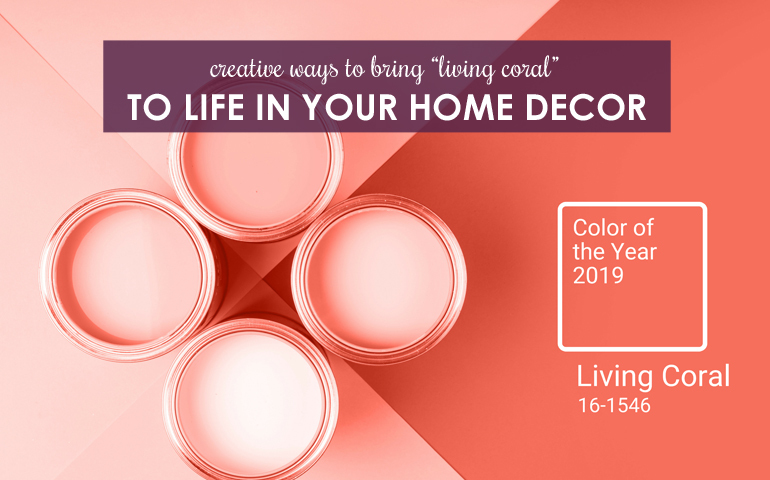 This year proves to be the year of “Living Coral” or slightly salmon or a pretty shade of pinkish orange that is taking over designs on items from clothing to couches – and everything in between. Looking to amp up your home’s style this year? Infuse a little living coral among your usual hues. You’ll give your home new life and be on the cutting edge of color for the next year. 1. Purchase a statement piece. Maybe you’ve been wanting to add a pop of color to your usual décor for quite a while. Maybe you’re just feeling like trying something different in this new year. Either way, Pantone’s living coral provides you with the perfect opportunity to pump up your home décor with some colorful trendiness. Find a piece of furniture to accent your normal hues or let a colorful rug show off your style with this vibrant color. 2. Accent with some attitude. If you’re not feeling ready to commit to an entire statement piece in Pantone’s living coral color, consider some colorful throws or pillows to make your design point at home. These fresh pops of color are sure to add instant style to any décor. A little living coral is sure to liven up even the most neutral items in your home. 3. Use the color to brighten a dark room. Really digging this year’s color of the year, but have a few concerns about how it might mesh with your usual décor? No problem! If your home has a spare room or extra bedroom that is not often used, make that your place to test out living coral. Freshen up a dark or unused space by using this year’s bright hue to bring some life. If you love the way it looks in a smaller space, take it to the next level by adding splashes of living coral throughout your home. 4. Dish out the color in small ways. As much as you might love Pantone’s new color of the year, you might just not be ready to make a full commitment to adding it to your home. And that’s OK! Instead of taking living coral and decking out all your bedrooms and beyond, add the bright color in small ways. Infuse your home with dishware that reflects the most modern colors. Add a decorative platter, stemware or a couple serving dishes. Show your love for the new color in small ways to impress spring and summer guests in your home. Particularly during a time when cold weather can keep us feeling a little down indoors, Pantone’s living coral is a welcome pop of color that can have any home feeling a little brighter and more stylish. Be bold and embrace the color of the year in your home décor today!